Runners are reflected on the wet pavement as they came down Boylston Street toward the Boston Marathon Finish Line in Boston in 2015. This story was initially published ahead of the rainy 2018 Marathon. No one in New England is thrilled about rain on Marathon Monday. But for the runners, a wet race is more than just a little dreary — it requires extra precaution to stay safe for the entire 26.2 miles. 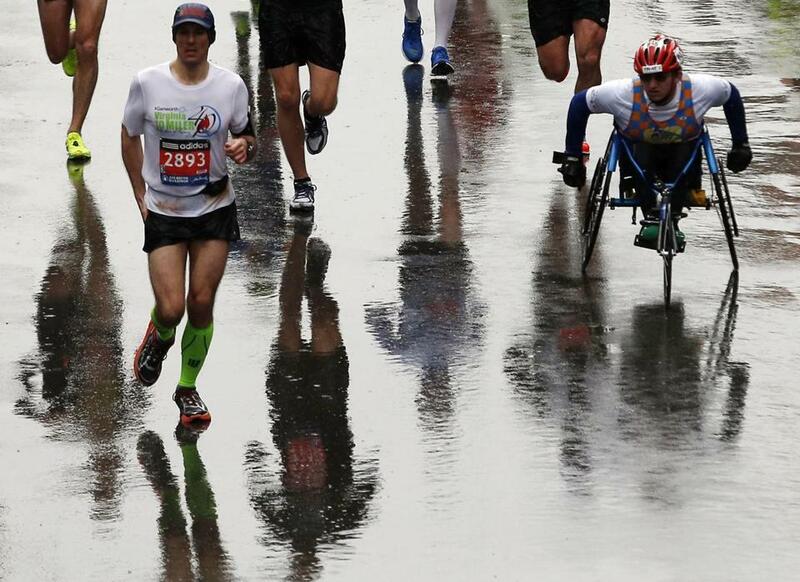 For Ruben Sanca, it won’t be the first time running a rainy Boston Marathon. Sanca ran the Marathon in 2015 (and again in 2018), and he said the rainy weather is far from ideal, but it’s manageable, especially when temperatures are warmer. “You feel like you’re having a bad race, but you have to just kind of keep pushing through,” said Sanca, a Cape Verdean Olympic athlete living in Chelmsford, who owns an online marathon coaching business. Sarah Dussault, a Boston-based fitness blogger, also ran the Marathon in 2015. She described the race as “miserable” in the downpour but met her goal of finishing under four hours anyway. Sanca and Dussault offered tips for runners hoping to have a smooth race Monday, despite the wet weather. Putting duct tape on the very top of your sneakers can keep some water from getting inside your shoes and drenching your feet, Sanca said. It won’t keep your feet entirely dry, but “that can help a little bit,” he said. “It can help so you’re not getting as much water because running with wet feet can be really, really bad for you,” he said. This is good advice for running any race — rain or shine — but especially in bad weather, it’s important to wear the right size sneaker, Sanca said. And make sure those shoes have good traction, Sanca said. If the sole of your shoe slips during the race, you risk injuring yourself. When the tape on your shoes isn’t enough, a dry pair could be a lifesaver. Dussault said when she ran the race in the 2015 downpour, her boyfriend met her around mile 17 with a fresh of sneakers. And learn from Dussault’s mistake — make sure the shoes are untied when given to you, she said. This one is a creative one — you may be putting on gloves this year to keep your hands warm, but Sanca recommends an extra pair of gloves underneath to keep your hands dry, too. Wear something waterproof that you can easily put away before the race begins, so you can keep yourself as dry as possible until you cross the start line. Dussault said she was lucky enough to be able to stay inside leading up to the race, but she offered some advice for those who can’t. You might think bad weather means you should cover up more, but Sanca recommends you resist that urge. More clothing on you means more wet clothing during the race, so he suggests all runners dress as they would have under clear skies. “The clothes are going to get wet, and then you’re basically going to get stuck running with wet clothes, and that can be worse,” he said. But if you have a hat, he said, that could be helpful. After all, no one wants to run with rain in their eyes. And one more from the Boston Athletic Association: Make a post-race plan. The body temperature of runners drops when they stop running. Though the BAA will have materials to help runners keep warm and a medical team available, creating a plan beforehand — Where will you exit the race? Where will you meet family or friends? — is the best way to be prepared. Felicia Gans can be reached at felicia.gans@globe.com. Follow her on Twitter @FeliciaGans. Laney Ruckstuhl can be reached at laney.ruckstuhl@globe.com. Follow her on Twitter @laneyruckstuhl.